Remember your strength always with Jen Pleasant’s unique recycled brass and sterling silver necklace. It's one thing to be a nice person to others, but do you also show yourself some love? Each time you feel afraid, remember you're tougher than what's in your way. Jen Pleasants designed this inspirational piece to help you do just that. She takes bits of recycled brass and sterling silver, melts them down, and etches the words "stronger than fear" into both the center pendant and three bars on the chain. 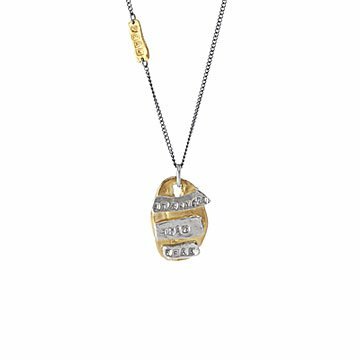 Give the kind pendant to a friend to help lift their spirits and add a lovely shimmer to their look. Handmade in California. One of Jen Pleasants' favorite aphorisms is, "The only zen you will find at the top of the mountain is the zen you bring up there." Her Northern California studio, however, is not on a mountaintop but in a renovated goat shed with a living roof. Surrounded by crystals inside and redwoods outside, she creates pieces that are an external reflection of the beauty, magic, and power that we each possess on the inside. The organic nature of her designs coupled with the inspirational messages behind them gives each piece a one-of-a-kind, meaningful feel. Jen's jewelry emphasizes positive affirmations and is crafted with recycled metals and ethically sourced stones. Take a studio tour to see where Jen's jewelry takes its shape! Pendant: 1" L x .6" W Chain: 26"
I bought this necklace on a whim as soon as I saw it, and I love it! It's cool, unique and inspirational all at the same time.